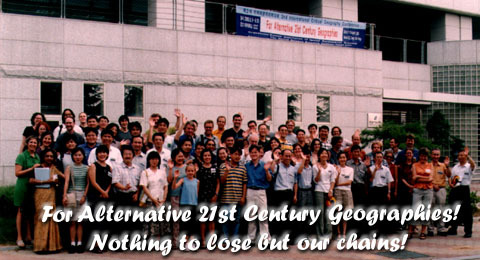 After a very successful inaugural conference in Vancouver in August 1997, the second ICG conference in Taegu attracted participants from more than 20 countries. More than 80 papers and presentations were given. The wider political context in which the conference took place added to the sense of excitement. For a radical conference in particular it is sobering to remember that until 1988 South Korea was a military dictatorship in which the kind of conference we had would either have been impossible or would have come at a very high personal price. More contemporary political events also played a role. In July Seoul police had attacked striking workers at the Lotte Hotel conglomerate and strikers were highly visible in both Seoul and Taegu. A doctor’s strike commenced as the conference opened, and demonstrating students demanded an end to US military occupation. Approximately 37,000 US troops remain in South Korea. The biggest political event however was the August 14 reuniting of 100 North Korean families with their South Korean, separated 50 years ago amidst the Korean War, and a similar reuniting of 100 South Korean families in Pyongyang. These events brought riot-clad police into the streets. The conference was welcomed by the President of the University of Taegu and in the opening session Byung-Do Choi of Taegu, the local organizer, set out the conference theme and made an optimistic appeal that the time is right for a critical re-evaluation of utopian thinking. Alternative 21st Century Geographies are within our grasp. Blanca Ramirez (Universidad Autonoma de Mexico) then argued that we need to have a clear sense of the politics involved in constructing an International Critical Geography Group. She emphasized the need to construct a political unity but one that recognized and clarified differences both within critical geography and vis-a-vis other non-critical geographies. What makes us critical is becoming a pressing question. In this process it is vital that we generate and learn from the knowledge coming from the global south. But there are many frustrations here: it is difficult for scholars in the “south” to change the conversation in the north, and the hegemony of English compounds this, but if we are to be truely international we have to work hard to make this happen. One of the continuing discussions throughout the conference concerned the “People’s Geography Project of the United States” launched in 1999 and introduced at the conference by Don Mitchell (Syracuse, USA). The goal of this project is both to make geography accessible to ordinary people and to find ways of expressing the organic geographic knowledge that people have in their everyday lives. These ideas were laid out in the first regular session. There followed an exciting report on international struggles against sweatshops in Guatamala by a geographer-organizer (Traub-Warner and Cravey), an analysis of why geography has been, traditionally, such a conservative discipline (Ramirez) and an appeal that radical and critical geography examine its own shibboleths and take seriously again theories of how social production, reproduction and power are structured in capitalist societies (Smith). Another highlight of the conference came with reports on the status of critical, radical and alternative geographies in different national context. A very energetic group of faculty and students came to the conference from Taiwan, and they organized two sessions “The critical geographies of Taiwan.” These connected programmatic statements, such as Chu-Joe Hsia’s discussion of the role of radical intellectuals vis-a-vis the state and political movements, with empirical explorations of the economic development of Taiwan since the postwar period, issues of urban development, and an attempt by Li-Ling Huang to connect spatial and cultural studies to local political geographies in Taiwan. Another session reported on critical geographies in Japan (Mizuoka), which has had a marxist geographical tradition since the 1950s (recently dissipated); India (Banerjee-Guha) where a conservative colonial tradition remains a major obstacle; and South Korea (Choi) where the history of critical geography is short but expanding dramatically. Georgina Calderon Aragon’s paper argued that the issues leading to the 1999-2000 strike at the Universidad Autonoma Nacional de Mexico (UNAM) signified an assault by neo-liberalism on the “revolutionary social pact” that had governed Mexico for decades. There was also much very interesting discussion about the effects of the 1997-99 economic crisis that had such a disastrous effect throughout Asia. Participants got an especially detailed view of the ways in which the “IMF crisis” affected South Korea. Entire sessions were devoted to high-tech and regional development, housing, and homelessness in South Korea today, and various papers discussed issues of regionalization (Bae-Gyoon Park), the auto industry (Yong-Sook, Lee) unemployment (Sung-Kyun, Lee) and specific urban case studies (Ulsan, Seoul, Taegu, Pusan). For those of us not from Korea, the overall result was a very complex picture both of Korean economic growth since the late 1950s and the social, cultural and political effects of the “IMF crisis.” This continental focus was filled out by other papers on Malaysia, Hong Kong, Vietnam and China, as well as Taiwan and Japan, including Naoki Oshiro’s discussion of regional identity and the struggle against US occupation in Okinawa. Globalization was, of course, a central theme. It figured in many sessions but was the specific focus of a session on the “Geographies of globalization: after Seattle.” Hickey and Wright gave first-hand accounts of the Seattle uprising while Fujita Tetsushi asked the question whether local cooperation could effectively defeat global corporations. Cindi Katz argued that globalization was equivalent to a war on the conditions of social reproduction confronted by poor women across the world. One session took on narratives of nation, state and belonging in the context of globalization (Bialasiewicz, Painter) another the politics of tourism and the spaces of travel (Minca, Oakes). Other sessions tackled the question of social polarization in globalizing cities (Jorgensen, Lofgren) and questions of citizenship (Cheryl Gowar). Post-structuralist geographies (3 of 4 participants distanced themselves from the session title!) Also figured along with 3 sessions on nature, environment and political ecology, reporting on specific experiences from numerous countries. It is important to mention two other sessions. First, the people’s geography session on teaching radical geography. After discussion of the post-Cold war context (Kirsch) and the necessity (and difficulties) of teaching geography from the bottom up (Saunders), Mizuoka introduced a web-based teaching programme, and Michael Webber (Melbourne) announced a new web journal designed to scare away globalization. In another session participants from Japan, Australia and the US reported on plans and techniques for teaching radical geography in the classroom. We support it! One of the most interesting sessions came on the last day. Under the deceptively general title of “the politics of spatiality,” presenters from Germany (Struever and Best), Japan (Ishiyama), Canada (Pratt; Desbiens), and the United States (Morin) reported on specific struggles in which they had been involved. Perhaps more than any other session, the papers here connected to specific struggles by people who had been involved in them. No clear programmatic politics emerged from these reports, but rather a broad sense of the necessity of work, and optimism. A feisty penultimate session raised questions of what constitutes the politics of radical, critical and/or people’s geography, raising the question of the kinds of politics critical geographers are involved in and the kinds of movements we need to become a part of. Unlike most of the other sessions in a very varied and diverse conference, seemed to be dominated more by English-speaking attendees. Plans for the 3rd ICG conference were discussed as was a proposal to produce an annual volume of critical geography work. The focus then passed back to Korea and after 2 short presentations (Park, Sang-Hun Lee) there was a very informative discussion of the complicated issue of the reunification of Korea. The final session picked up the theme of the politics of critical geography and of a tempered optimism. David Harvey’s talk had nothing to do with the title he had given but everything to do with creating an identity for “critical geography.” We are academics, he began, and our job is to be critical, so what marks us off from ordinary academics? The rest of his talk explored ways of pulling together a critical geography that is simultaneously broad, ambitious and able to conceive of radically different political futures. In addition to our nightly pilgrimage to the bars in the village outside the campus gates, the evenings were filled by absorbing cultural presentations. The poet Bud Osborn read a long, intense poem he prepared for the conference, touching on the destitution of life for many (himself included) on the streets of Downtown Eastside Vancouver. He connected with Korean themes and Korean poetry, and was backed up by a student rock band with which he had become acquainted. On another warm evening, we were treated to traditional Korean dance under the stars, a tremendous performance. The conference officially concluded with field trips to the US military base on the outskirts of Taegu and to a huge industrial complex in the city. There were many differences of opinion and politics at Taegu but the sense of a broadly unified purpose was overwhelming. All of the attendees seemed to come away with an exhilarating sense that the ICG has already achieved some modest successes and established itself as a venue where the discussion starts from a sophisticated mix of political assumptions. The combination of wide international involvement and a critical politics is powerful and hopeful. The debates were invigorating but we were collectively more optimistic than many of us have felt in recent years – more optimistic that fundamental political change can be made to happen.